services, dinners, bake sales, school information & more! Advertising information - where to shop in and around our communities! 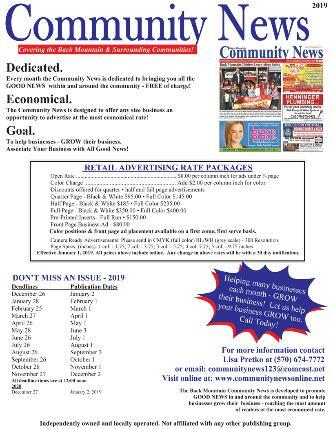 2005 - 2019 Copyright - Back Mountain Community News Content on this site may not be copied or duplicated without the prior written consent of the publisher. Community News Likes on facebook! Deadline for May is on Friday, April 26 at 9:00am. It's All Good News ... Where Community Matters! Click above for a new puzzle everyday!